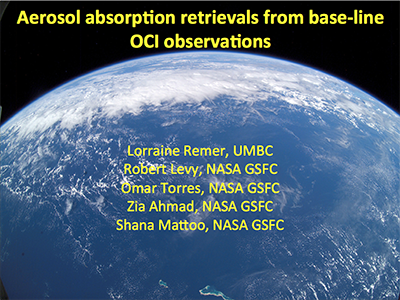 Aerosol absorption is a key aerosol parameter required for quantification of direct aerosol radiative forcing and has been linked to changes in atmospheric circulations and large scale precipitation patterns and to cloud macrophysical properties over large regions. Thus, a satellite aerosol product that quantifies absorbing aerosols will make a significant contribution to climate science. 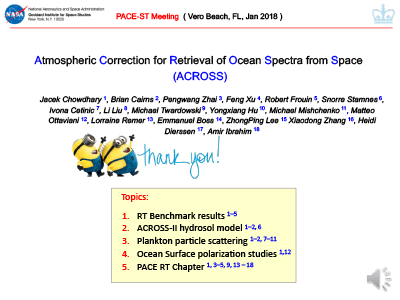 Absorbing aerosols also confuse atmospheric correction over oceans and interfere with determination of ocean water-leaving radiances, even at low aerosol loading. Thus, both the atmospheric and oceanic communities are united by their need to identify and quantify absorbing aerosols over the global oceans. 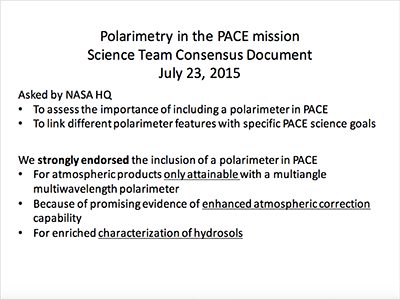 The Pre-Aerosols-Clouds-Ecosystem (PACE) mission will attempt to push oceanographic science a full step forward by defining the Ocean Color Instrument (OCI) with hyperspectral capability from the ultraviolet (UV) to the near-infrared (NIR), and with additional wavelengths in the shortwave infrared (SWIR). 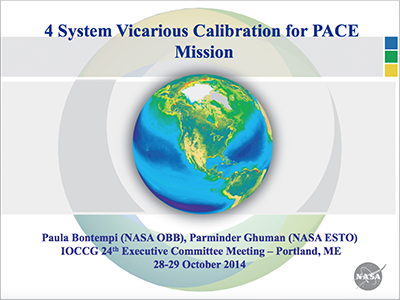 We propose here that the basic PACE OCI instrument, with no enhancement, will also make a significant improved contribution to aerosol science. 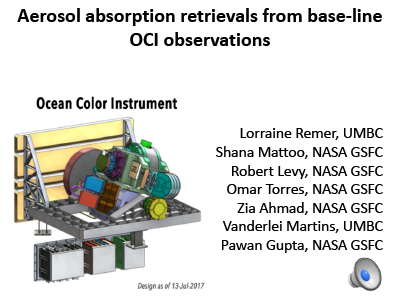 OCI is an exciting instrument for aerosol scientists because it will be the first truly broad spectrum U.S. instrument, effectively combining the aerosol-retrieval capabilities of MODIS and OMI, but on the same instrument, at the same spatial resolution. Sensitivity tests tell us that we should be able to retrieve 3 pieces of aerosol information from this configuration: nominally loading, absorption and either particle size or layer height. These published sensitivity tests are far from complete and they do not cover the wide range of circumstances that are required to identify optimal wavelength configurations and retrieval assumptions necessary to prepare for producing an aerosol product from OCI. Here we propose a series of theoretical studies to determine the uncertainties involved in 1) identifying absorbing aerosol at low aerosol optical depth (AOD) for the purposes of atmospheric correction, and 2) retrieving aerosol information including AOD and absorption at moderate to high AOD. Our focus is on the over ocean retrievals, where the new broad spectrum OCI offers enhanced possibilities, but this will be overlaid on a global (ocean and land) product that would represent adapting existing OMI and MODIS algorithms to OCI radiances. We are offering a perspective towards atmospheric correction that is aerosol-centered, proposed by investigators who are undisputed experts in aerosol retrieval from an OCI type of sensor. This work represents the major theoretical exploration and defining of uncertainties necessary for producing an operational product from satellite data. In addition, the PI (Remer) is volunteering to serve in a leadership capacity on the PACE Science Team. Boss, E., and Remer, L.A. (2018). A Novel Approach to a Satellite Mission's Science Team, EOS, 99, doi:10.1029/2018EO092639. Jethva, H., Torres, O., Remer, L., Redemann, J., Livingston, J., Dunagan, S., Shinozuka, Y., Kacenelenbogen, M., Segal-Rosenheimer, M., and Spurr, R. (2016). Validating MODIS Above-cloud Aerosol Optical Depth Retrieved from Color Ratio Algorithm Using Direct Measurements Made by NASA's Airborne AATS and 4STAR Sensors, Atmos. Meas. Tech. Discuss., doi:10.5194/amt-2016-178. Levy, R.C., Munchak, L.A., Mattoo, S., Patadia, F., Remer, L.A., and Holz, R.E. (2015). Towards a Long-Term Global Aerosol Optical Depth Record: Applying a Consistent Aerosol Retrieval Algorithm to MODIS and VIIRS-Observed Reflectance, Atmos. Meas. 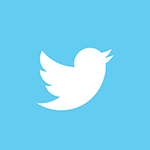 Tech., 8, 4083-4110, doi: 10.5194/amt-8-4083-2015. Yu, H., Chin, M., Yuan, T., Bian, H., Remer, L.A., Prospero, J.M., Omar, A., Winker, D., Yang, Y., Zhang, Y., Zhang, Z., and Zhao, C. (2015). The Fertilizing Role of African Dust in the Amazon Rainforest: A First Multiyear Assessment Based on Data from Cloud-Aerosol Lidar and Infrared Pathfinder Satellite Observations, Geophys. Res. Lett., 42(6), 1984-1991, doi: 10.1002/2015GL063040. Chin, M., Diehl, Tan, Q., Prospero, J.M., Kahn, R.A., Remer, L.A., Yu, H., Sayer, M., Bian, H., Geogdzhayev, I.V., Holben, B.N., Howell, S.G., Huebert, B.J., Hsu, N.C., Kim, D., Kucsera, T.L., Levy, R.C., Mishchenko, M.I., Pan, X., Quinn, P.K., Schuster, G.L., Streets, D.G., Strode, S.A., Torres, O., and Zhao, X.-P. (2014). Multi-Decadal Aerosol Variations From 1980 To 2009: A Perspective From Observations and a Global Model, Atmos. Chem. Phys., 14, 3657-3690, doi:10.5194/acp-14-3657-2014. Levy, R.C., Mattoo, S., Munchak, L.A., Remer, L.A., Sayer, A.M., Patadia, F., and Hsu, N. C. (2013). The Collection 6 MODIS Aerosol Products Over Land and Ocean, Atmos. Meas. Tech., 6, 2989-3034, doi: 10.5194/amt-6-2989-2013. Remer, L.A., Mattoo, S., Levy, R.C., and Munchak, L.A. (2013). MODIS 3 km Aerosol Product: Algorithm and Global Perspective, Atmos. Meas. Tech., 6, 1829-1844, doi: 10.5194/amt-6-1829-2013. Torres, O. and Remer, L.A. (2013). History of Passive Remote Sensing of Aerosol From Space, In Aerosol Remote Sensing (Lenoble et al., eds. ), 159-183, doi: 10.1007/978-3-642-17725-5_6DOI: 10.1007/978-3-642-17725-5_7. Yu, H., Remer, L.A., Chin, M., Bian, H., Tan, Q., Yuan, T., and Zhang, Y. (2012). Aerosols from Overseas Rival Domestic Emissions over North America, Science, 337(6094), 566-569, doi: 10.1126/science.1217576. Remer, L.A., Mattoo, S., Levy, R.C., Heidinger, A., Pierce, R.B., and Chin, M. (2012). Retrieving Aerosol in a Cloudy Environment: Aerosol Product Availability as a Function of Spatial Resolution, Atmos. Meas. Tech., 5, 1823-1840, doi: 10.5194/amt-5-1823-2012. Koren, I., Altaratz, O., Remer, L.A., Feingold, G., Martins, J.V., and Heiblum, R.H. (2012). Aerosol-Induced Intensification of Rain from the Tropics to the Mid-Latitudes, Nat. Geosci., 5, 118-122, doi: 10.1038/ngeo1364. Martins, J.V., Marshak, A., Remer, L.A., Rosenfeld, D., Kaufman, Y.J., Fernandez-Borda, R., Koren, I., Correia, A.L., Zubko, V., and Artaxo, P. (2011). Remote Sensing the Vertical Profile of Cloud Droplet Effective Radius, Thermodynamic Phase, and Temperature, Atmos. Chem. Phys., 11, 9485-9501, doi: 10.5194/acp-11-9485-2011. Yuan, T., Remer, L.A., and Yu, H. (2011). Microphysical, Macrophysical and Radiative Signatures of Volcanic Aerosols in Trade Wind Cumulus Observed by the A-Train, Atmos. Chem. Phys., 11, 7119-7132, doi: 10.5194/acp-11-7119-2011. Yuan, T., Remer, L.A., Pickering, K.E., and Yu, H. (2011). Observational Evidence of Aerosol Enhancement of Lightning Activity and Convective Invigoration, Geophys. Res. Lett., 38(4), L04701, doi: 10.1029/2010GL046052. Meskhidze, N., Remer, L.A., Platnick, S., Negrón Juárez, R., Lichtenberger, A.M., and Aiyyer, A.R. (2009). 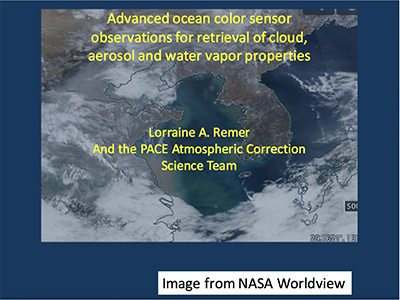 Exploring the Differences in Cloud Properties Observed by the Terra and Aqua MODIS Sensors, Atmos. Chem. Phys., 9, 3461-3475, doi: 10.5194/acp-9-3461-2009. 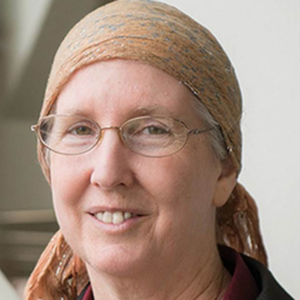 Yu, H., Chin, M., Remer, L.A., Kleidman, R.G., Bellouin, N., Bian, H., and Diehl, T. (2009). Variability of Marine Aerosol Fine-Mode Fraction and Estimates of Anthropogenic Aerosol Component Over Cloud-Free Oceans from the Moderate Resolution Imaging Spectroradiometer (MODIS), J. Geophys. Res., 114(D10), D10206, doi: 10.1029/2008JD010648. 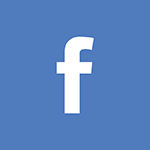 Satheesh, S.K., Torres, O., Remer, L.A., Babu, S.S., Vinoj, V., Eck, T.F., Kleidman, R.G., and Holben, B.N. (2009). Improved Assessment of Aerosol Absorption Using OMI-MODIS Joint Retrieval, J. Geophys. Res., 114(D5), D05209, doi: 10.1029/2008JD011024. Koren, I., Vanderlei Martins, J., Remer, L.A., and Afargan, H. (2008). Smoke Invigoration Versus Inhibition of Clouds over the Amazon, Science, 321(5891), 946-949, doi: 10.1126/science.1159185. Remer, L.A., Kleidman, R.G., Levy, R.C., Kaufman, Y.J., Tanré, D., Mattoo, S., Martins, J.V., Ichoku, C., Koren, I., Yu, H., and Holben, B.N. (2008). Global Aerosol Climatology from the MODIS Satellite Sensors, J. Geophys. Res., 113(D14), D14S07, doi: 10.1029/2007JD009661. Yu, H., Remer, L.A., Chin, M., Bian, H., Kleidman, R.G., and Diehl, T. (2008). 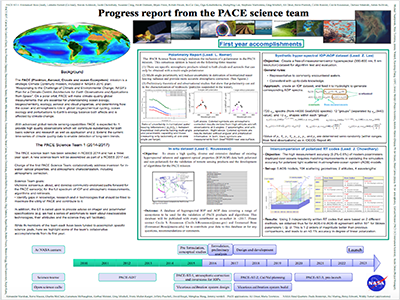 A Satellite-Based Assessment of Transpacific Transport of Pollution Aerosol, J. Geophys. Res. 113(D14), D14S12, doi: 10.1029/2007JD009349. Koren, I., Remer, L.A., Kaufman, Y.J., Rudich, Y., and Martins, J.V. (2007). On the Twilight Zone Between Clouds and Aerosols, Geophys. Res. Lett., 34(8), L08805, doi:10.1029/2007GL029253. Remer, L.A. and Kaufman, Y.J. (2006). Aerosol Direct Radiative Effect at the Top of the Atmosphere Over Cloud Free Ocean Derived from Four Years of MODIS Data, Atmos. Chem. Phys., 6, 237-253, doi: 10.5194/acp-6-237-2006. Kaufman, Y.J., Remer, L.A., Tanré, D., Li, R.-R., Kleidman, R., Mattoo, S., Levy , R.C., Eck, T.F., Holben, B.N., Ichoku, C., Martins, J.V., and Koren, I. (2005). A Critical Examination of the Residual Cloud Contamination and Diurnal Sampling Effects on MODIS Estimates of Aerosol Over Ocean, IEEE T. Geosci. Remote, 43(12), 2886-2897, doi: 10.1109/TGRS.2005.858430. Kaufman, Y.J., Koren, I., Remer, L.A., Rosenfeld, D., and Rudich, Y. (2005). The Effect of Smoke, Dust, and Pollution Aerosol On Shallow Cloud Development Over the Atlantic Ocean, P. Natl. Acad. Sci. USA, 102(32),11207-11212, doi: 10.1073/pnas.0505191102. Remer, L.A., Kaufman, Y.J., Tanré, D., Mattoo, S., Chu, D.A., Martins, J.V., Li, R.R., Ichoku, C., Levy, R.C., Kleidman, R.G., Eck, T.F., Vermote, E., and Holden, B.N. (2005). The MODIS Aerosol Algorithm, Products, and Validation, J. Atmos. Sci., 62, 947-973, doi: 10.1175/JAS3385.1. Koren, I., Kaufman, Y.J., Remer, L.A., and Martins, J.V. (2004). Measurement of the Effect of Amazon Smoke on Inhibition of Cloud Formation, Science, 303(5662), 1342-1345, doi: 10.1126/science.1089424. Kaufman, Y., Martins, J.V., Remer, L.A., Schoeberl, M.R., and Yamasoe, M.A. (2002). Satellite Retrieval of Aerosol Absorption Over the Oceans Using Sunglint, Geophys. Res. Lett., 29(19),1928, doi: 10.1029/2002GL015403. Martins, J.V., Tanré, D., Remer, L., Kaufman, Y., Mattoo, S., and Levy, R. C. (2002). MODIS Cloud Screening for Remote Sensing of Aerosols Over Oceans Using Spatial Variability, Geophys. Res. Lett., 29(12), 8009, doi: 10.1029/2001GL013252. Remer, L.A., Kaufman, Y.J., Holben, B.N., Thompson, A.M., and McNamara, D. (1998). Biomass Burning Aerosol Size Distribution and Modeled Optical Properties, J. Geophys. Res., 103(D24), 31879-31891, doi: 10.1029/98JD00271. Remer, L. A. and Kaufman, Y. J. (1998). Dynamic Aerosol Model: Urban/industrial Aerosol, J. Geophys. Res., 103(D12), 13859-13871, doi: 10.1029/98JD00994. Remer, L.A., Gassó, S., Hegg, D.A., Kaufman, Y.J., and Holben, B.N. (1997). Urban/Industrial Aerosol: Ground-Based Sun/Sky Radiometer and Airborne In Situ Measurements, J. Geophys. Res., 102(D14), 16849-16859, doi: 10.1029/96JD01932.